You know how sometimes you'll see something on pinterest and want to buy it really bad until it leads you to the Restoration Hardware website where it costs $220? 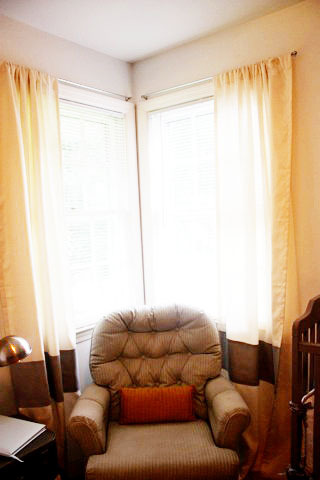 I saw this picture and thought these curtains would be perfect for Grady's nursery. Until I got to the RH website and saw they cost $109 per panel. Yes, per panel. Then they were whatever the opposite of perfect is. Un-perfect. But, they didn't look so $109 special that I couldn't try to make them myself. Two cream curtain panels for $20 from Target and leftover gray linen from my faux roman shades was all it took. I cut my gray fabric into matching stripes. Ironed and sewed the edges. Figured out where I wanted to place my stripes on the curtains. Got out my stitch witchery to avoid two seams on my stripes. And then admired my Restoration Hardware Knock-off's. Today marks my self-imposed deadline for Grady's nursery - one month from his due date. Save for a few minor touch-ups, I am declaring his nursery officially done. Just barely making that deadline, that's how I roll. Let's hope Grady follows suit and comes on or before his due date!! Fantastic knock off! They look just like the RH version and really now, who comes up with those prices? Thank you! That's exactly what I was thinking! $220 for curtains, really?